HAPPY NEW YEARS 2016 FROM DOGHOUSEPLANS.CA! 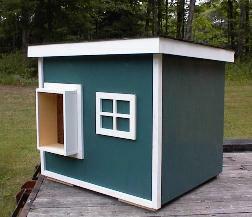 Dog house plans.ca congratulates you on finding the best dog house plans available! Our dog houses were originally available only to law enforcement agencies; however, due to the high demand for these wonderful dog houses, we have now made the police dog house plans available to the general public in a wide array of sizes and models. 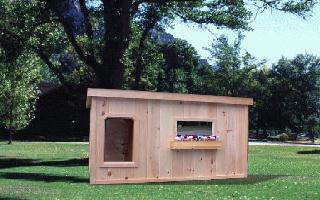 Being in business for over 35 years, we have constructed an abundant amount of dog houses in many different styles. After much consulting and feedback from law enforcement officers, vets, and kennel organizations, we have come up with this final design as being the most efficient trusted and proven, structurally sound design for both the dog and the owner. Our dog houses were designed in consultation with veterinarians and K-9 handlers to meet the needs of a wide range of dogs and owners. 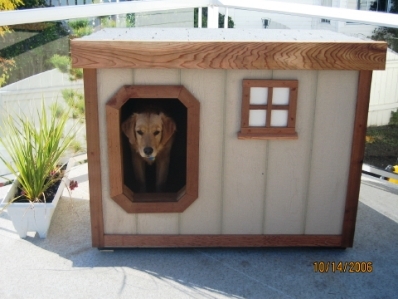 Over the years, we have built dog houses with barn and peak style roofs. Building dog houses with these styles of roofs is an ideal place for wasps, hornets, and other types of insects or animals to congregate and build their nests. When using these styles of roofs, you will not have an inside wind wall which protects the K-9's in cold and windy weather, and their will also be a large amount of heat loss. It is also not designed with the handler in mind when it comes to cleaning. This is why our dog house plans have a slightly sloped roof, that is on hinges, which makes cleaning and accessibility to the inside of the dog house very easy. 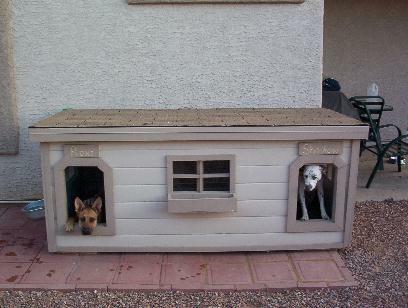 All dog houses have a removable wind wall for the comfort of your K-9's. This removable wind wall is designed for the correct size of your K-9's in order for the K-9's to be able to heat the sleeping area with there own body heat. Our dog houses are used by in housing all kinds of highly trained canines in areas such as bomb detecting, narcotics, and forensics, as well as search dogs for tracking and crowd control. Many city departments, Ontario Provincial Police, State Police, Fire Marshals, Natural Resources, Border and Customs Officers, and Private Security Agencies, use our dog houses. Whether you have a professional service K-9 valued at thousands of dollars or, a working dog, hunting dog or herding dog, or a family pet who watches over the yard, this would be the best and most proven dog house that you could have, to protect your K-9 in all weather conditions. Our dog houses are presently in use throughout many different countries all over the world, such as Australia, the United Kingdom, Canada, Europe, and across the United States. 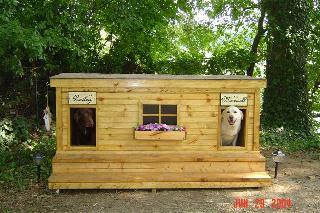 These dog houses has been proven suitable in any climate. 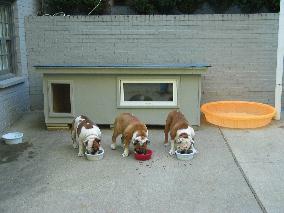 These dog houses can be adjusted to match the weather condition of where you are located. In areas where the summers are hot and humid, raise the hinged roof to let the warm air out and draw the fresh air in, while still providing your K-9's with a comfortable area of shade. This small task creates ample air flow for your K-9's and even though the roof is raised, this cannot be detected if you're looking at the dog house. The K-9's will still be able to get on top of the roof, when it is raised, without causing any harm to the structure. In the cold winter months, insert the wind wall, and lower the roof. The wind wall breaks the wind and creates a smaller space inside the dog house that your K-9 or K-9's can easily warm with there own body heat. It is imperative that your dog house is sized to match your K-9 's, so he or she sleeps in a space small enough that he or she is able to heat. A dog house has to be structurally sound to protect your K-9's. Our dog house plans have the houses slightly elevated off the ground, keeping the floor safe from moisture. The hinged roof opens and closes easily, so cleaning the inside is quick and simple. You can use paint or stain to protect the outside. The roof is slanted, so water drains away on rainy days, but is still flat enough, so that your K-9's can keep watch, or take a nap on top of the dog house, when the weather is suitable. These dog houses are fully insulated on the floor, roof and walls. It is constructed like a house you or I would live in. Once completed, this beautiful dog house will last for many many years. This will most likely be the last dog house you will have to build. All our dog house plans come with the instructions for an optional outside kennel attachment. 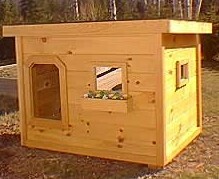 If you already have an existing kennel, these plans allow you to attach the dog house to the outside of the kennel. Using this method you will still give your K-9's the full use of the kennel area, and also allow them to have the best dog house available. Connecting the dog house to an existing kennel is easy. 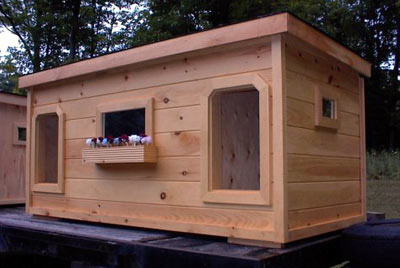 No special woodworking skills are required to build from these dog house plans. A few common tools are all you will need. With a hammer, square, handsaw (or skillsaw), a jigsaw, and a drill, you will have all the tools you need to construct your dog house. 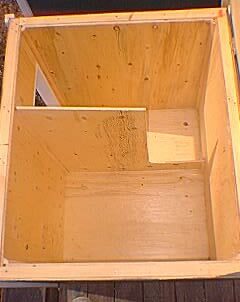 Paint or stain the outside whatever color you or your K-9's would like, or, build the deluxe version and surround the outside of the dog house in attractive tongue and groove pine, for the look of a stained, natural wood exterior. Step by step instructions for building both the regular dog house and the deluxe dog house are included with each set of dog house plans, for the size and model you choose. 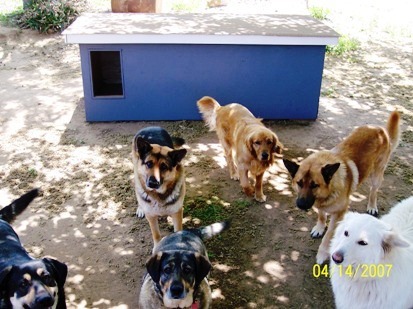 Our 2 dog and 3 dog house plans arose from the requirements of K-9 handlers who needed more than one K-9 with different skills for different kinds of work, yet wanted to keep the dogs in one place. 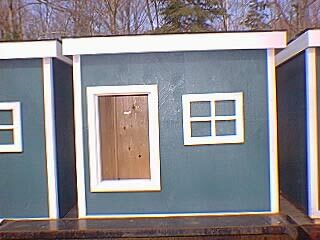 The 2 dog/1 door dog house, and the 3 dog/1 door dog house designs have the same removable wind wall as our 1 dog/1 door dog house. Due to the fact that not all dogs get along, you may want to keep your dogs separated. This is where the 2 dog/2 door dog house plans are the answer for you. This model has two doors and a removable wind wall for each K-9, with an additional center partition wall to keep the dogs separated. This center wall is also removable in case your dogs solve their dispute or you want to house a different pair of dogs in the future. All 2 dog or 3 dog dog house plans have the same insulation, hinged roof, and the other features as our 1 dog/1 door model. So, if you have one, two, or three dogs, these versatile tested and proven dog house plans are what you require to meet both your needs and your pets needs. 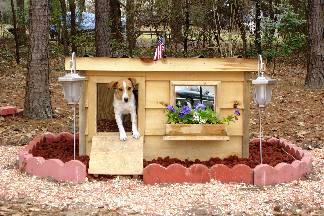 Do you have special requirements for your pet's house? Do you need custom dog house plans drawn? At present we have designed houses for pot bellied pigs, goats, tortoises, cats, chickens, Mini Horses,etc. With our 35 years of experience and knowledge of dog houses we have compiled a list of things to for you to look at before you purchase any dog house plans. 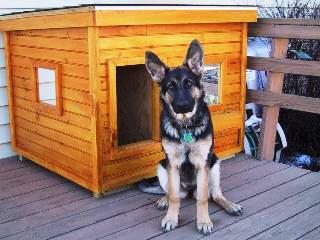 This list will help you decide where you should purchase your police dog house plans. We call it our “Buyer Beware List” and hope this will give you some of the knowledge we have acquired over the years. 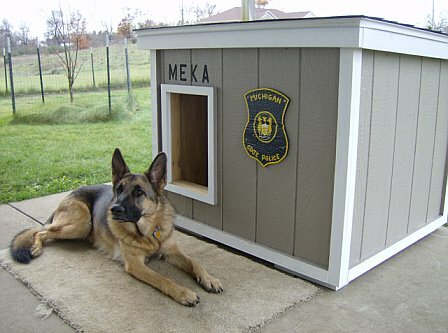 Each set of police dog house plans is $29.99 (Can. Currency) and includes shipping and handling. "Don't Delay, Give your Pets the Comfort They Deserve Today"